All of us at rasa.io are excited to share the results of our latest customer case study! We began working with the American Society for Microbiology (ASM) in early 2018. ASM and rasa.io set out to achieve three primary goals when beginning our newsletter partnership: 1) increasing newsletter engagement via open and click through rates; 2) personalizing newsletter content by way of using Artificial Intelligence; and 3) saving time with rasa.io automated content curation. Read the full rasa.io American Society for Microbiology case study here. It’s the ultimate goal from a marketing and communications standpoint to be able to interact with an audience on an individual level. ASM now achieves this goal with AI, and they also enjoy additional benefits that come along with leveraging rasa.io technology, including additional traffic to the ASM website, insightful reports sharing the most popular topics amongst members, and automatic infusion of ASM developed content as well as the latest, and most important messages for members. Creativity can often be hindered by tedious tasks that are a part of your everyday work life. 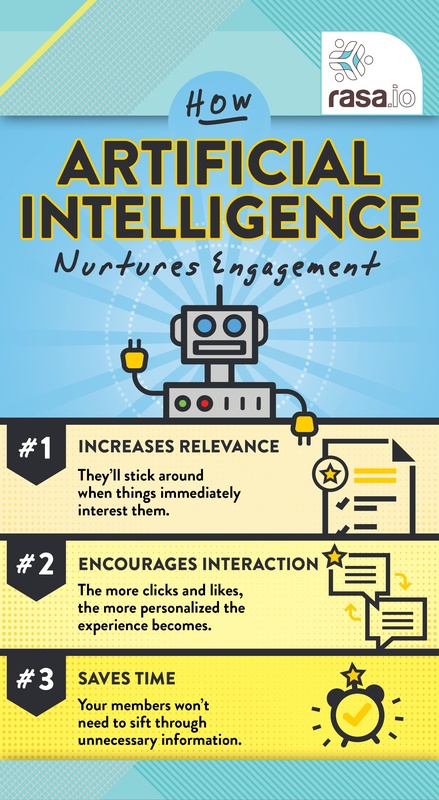 AI can automate these processes and free up time for you to focus on producing creative, meaningful content. With our Smart Newsletter, hand curating your internal and external content, email distribution list, article placement, send time and frequency are among the many automated features. Being less bogged down with the nuts and bolts of your distribution process allows you to work in a more creative head space which will improve the quality of your work. With this increased capacity you are also able to focus on driving innovation within your organization and gaining an edge on your competition. AI can collect and quickly analyze mass amounts of data gathered by the behaviors of each individual reader. This data can reveal important insights into what matters the most to your audience. Knowing what subjects are of the highest interest to your members will help you better decide the nature of your future content. The rasa.io platform breaks down these analytics in several different ways: topics, sources, and articles. You can use these insights to generate highly relevant content as well as ideas for other forms of marketing. A more informed strategy for your writing will also lead to increased readership and trust in your brand. Once you’ve optimized your creative process and used your data to create quality content - you need to distribute that content appropriately. AI has the ability to personalize emails on a massive scale. It can automatically match each individual’s interests with the most relevant articles and subject lines. This personalization will result in increased engagement which leads to more valuable insights and opportunities for new revenue streams. Are you ready for a more innovative and effective content strategy? Learn about how you can use our AI-powered Smart Newsletter to deliver your members the content they want to read. Every time you engage with your social media platforms, they become a little better at understanding what you want to see, which affects the content that they present to you. Of course it is no coincidence that the product you were recently searching for via Google is being advertised at the top of your Facebook feed and pictured at the top of your Instagram! Facebook, for example, has become an expert on you because of its application of artificial intelligence. What does that mean? AI leverages complex algorithms to sort through your engagement behavior in order to decide what you will find most interesting to present next in your feed. As an experiment, scroll through your feed for a minute. Now try sorting it by “Most Recent”. Which made for a more compelling read? This is in large part why Facebook still has over one billion active users even after all of these years; they have perfected the game of engagement. There are numerous applications of AI these days. Approachable applications of AI. Applications of AI which will allow you to engage your members on a completely different level. Have you considered what throwing artificial intelligence into the mix will do? At rasa.io we use AI to perfect the content that our clients' members receive. In a world with an overabundance of content, we help members sort through the noise and get connected with the articles, blogs, news and stories that are actually relevant to them. Learn about how rasa.io can begin to use artificial intelligence to deliver your members the content they want to read and increase your member engagement. 1 - The research is there. 2 - It’s all about evolution. For example, retail stores are closing all over the country and constantly receiving bad press for these failures. At the same time, Direct to Consumer brands like Warby Parker and Bonobos are opening more and more brick and mortar stores. Neil Blumenthal, the co-founder of Warby Parker explains, "I don't think retail is dead. Mediocre retail experiences are dead." The same goes for email marketing - email isn't dead, mediocre email is dead. If you are sending out the same stale emails, your members will disengage. 3 - A new, automated normal does exist. Want to know the secret to member engagement? The key to member engagement is listening to your members. On the importance of listening, author Doug Larson once said: "Wisdom is the reward you get for a lifetime of listening when you'd have preferred to talk." In the first part of our series, we explored the importance of listening to your members in order to leverage their feedback for maximum engagement. In the second part of our series, we explored 7 applicable tactics for listening. In this third and final part of our series, we will explore how you can listen to members at scale and automatically implement their feedback in real time. You know the old saying: actions speak louder than words. Here’s an example of that in real life. A year ago, a member checked off four different interests on a form you sent out. However, for the last several months, unbeknownst to you, they’ve been primarily reading articles about a completely different topic. Here’s another one: Your team made an assumption based on survey data and board discussions that older members are concerned only with management issues. However, in reality, many of them are focused on “upskilling.” They need to learn about a certain new technology so they can remain relevant and employed. Again, you had no idea. You would know about their interests if you could observe what they’re doing—if you could “listen” to their behavior. Well, now you can. New tools make this type of listening easier. Software powered by AI, like rasa.io, observes and tracks online behavior. It “listens” and learns about a member’s interests by tracking the links they click, and refines what it sends in future emails based on what it learns. Personalized listening and communication is the purpose of rasa.io and the reason why our organization exists. But unlike the other listening methods described above, rasa.io is practically hands-off. Each daily newsbrief email is tailored for the individual subscriber according to their interests and done 100% automatically by the AI. rasa.io’s AI “brain” personalizes content for each daily newsbrief from a list of news sources, plus you can add your own content too. Because members soon realize the relevancy of their daily newsbrief, they’re more likely to open those emails and, therefore, see your content too. If your organization isn’t able to produce enough content on your own, providing a curated selection of content based on a member’s interest is undoubtedly one of the most valuable membership benefits you can provide. Listening to members—by using one of the seven methods described above or by using AI-powered software—provides valuable information. But with rasa.io, this data is provided in real-time. You can spot emerging interests and issues immediately instead of hearing about them eight months later on a survey. In many associations, the membership value curve is skewed. Only a minority of members can afford to go to events or spend time volunteering. They’re the ones who have traditionally experienced the most membership value. But many members don’t have the budget or time to get that same value. With a personalized daily newsbrief, everyone has a fair shot at experiencing the value of membership—and your association continually learns how to provide even more value to them. By now we have outlined the importance of listening to members, but we all know that we share one, limiting constraint: time. rasa.io AI-powered tools allow you to automatically adapt the content in your newsletters to individual member preferences, without having to lift a finger. Contact rasa.io today to learn how you can listen to your members in real time in order to meet their ever-evolving needs.